Florent Amodio of France performs his Short Program at the 2013 European Figure Skating Championships. France’s Florent Amodio skated to the lead in the Men’s short program at the 2013 ISU European Figure Skating Championships in Zagreb on Thursday. Javier Fernandez of Spain is a close second, while France’s Brian Joubert came in third. Drama unfolded when defending champion Evgeni Plushenko of Russia, hampered by a back injury, fell on a triple Axel and had to withdraw following the short program. Amodio was the last of the top contenders to skate and he turned in a strong program to the Brazilian-inspired piece Memories of Sobral by Sebastien Damiani. The 2011 European Champion opened with a quadruple Salchow and followed up with a triple Axel and a triple Lutz-triple toe combination that was in the second half of his program, which earned him a bonus. One spin was a level four, while the other two spins and the footwork garnered a level three. The reigning European bronze medalist improved his personal best by almost eight points with a score of 89.82 (49.18/40.64) points. 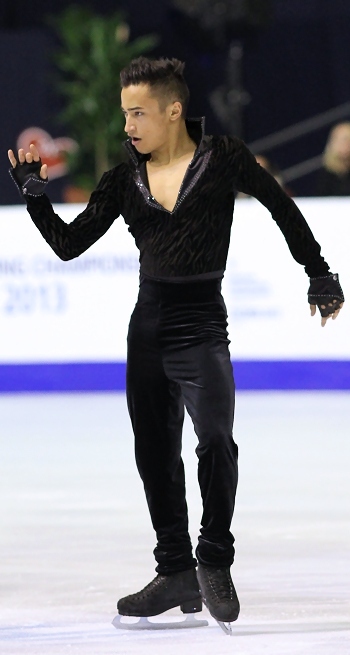 Amodio had dumped his Flamenco short program after the Grand Prix as he didn’t feel comfortable with it. Skating to The Mask of Zorro, Fernandez pulled off a quadruple Salchow, triple Axel, a triple Lutz-double toe combination, and three level-four spins. The 2011-12 Grand Prix Final bronze medalist also earned a new personal best, scoring 88.80 (46.87/41.93) points. The 2012 Skate Canada champion is close to winning a figure skating medal for Spain, a historic first at an ISU Championship. “I was a little bit scared because my skates were lost at the airport and I missed all the practices on the main rink and so I haven’t touched this rink before today,” the 21-year-old explained. Joubert had a rough start to the season and a lot of problems with his ice rink closing and changing coaches, however, he came out and proved that he is still a force to be reckoned with. The three-time European Champion did a three turn out of the the opening quad toe, but still managed to add on a triple toe. The triple Axel and triple Lutz were strong and he collected a level four for two spins in his program to Genesis and Aerodynamic by Daft Punk. The 28-year-old achieved a new season’s best with 83.93 (44.17/39.76) points. Michal Brezina of the Czech Republic came in fourth at 79.84 (40.91/38.93) points. He finally landed his quad Salchow in his routine to In the Hall of the Mountain King, but stepped out of the triple flip. He still added a double toe, but it didn’t count for a combination. The Czech recovered to land a nice triple Axel and earned a level four for two spins and his footwork. Russia’s Sergei Voronov turned in a strong performance to the Russian Sailor Dance to finish fifth at 78.38 (42.81/35.57) points. The national silver medalist hit a quad-triple toe combination, a triple Axel and triple loop. Voronov has positive memories of competing in Zagreb in 2008. “It was my first Europeans back then and I like to skate here,” he said. Plushenko had decided to come to Zagreb only on Friday as he is still battling a back injury. His condition had not improved since Russian Nationals and it was obvious in practice that he was not at a 100 percent. In the short, the 2006 Olympic Champion opted for the triple Lutz instead of the quad toe, but the landing was shaky. The bigger mistake, however, came when the 30-year-old fell on the triple Axel, although he recovered to land a triple loop-triple toe combination. Two spins were a level three while the change sit spin got a level four, but the footwork merited only a level two. The seven-time European Champion earned 74.82 (35.46/40.36) points. His right hand was bloody as he cut it while tying his laces right before he skated. Right after the end of the short program Plushenko withdrew as he suffered an aggravation of his chronic back condition. Maxim Kovtun of Russia landed a nice quad-triple toe combination but doubled the Axel and put his hand down on the triple Lutz to score 74.46 points. The 17-year-old finished in seventh place. “I don’t know what happened,” said the ISU Junior Grand Prix Final Champion. “It was terrible. Maybe I was nervous, but I was 100 percent prepared for the competition. Tomorrow, I will just begin to train again to prepare for the free. Sweden’s Alexander Majorov turned in a clean program that featured a triple Lutz-triple toe, a triple Axel and a triple flip. He collected 74.29 points and currently sits in eighth place. Like Fernandez, his luggage was delayed and he got it only Wednesday morning. Tomas Verner of the Czech Republic had won his European title back in 2008 on this ice in Zagreb, but luck wasn’t on his side at this event. After crashing on the quad toe, he also reduced his combination to a double Lutz-double toe, however, his triple Axel was good (68.99 points). Viktor Pfeifer of Austria gave a clean performance landing a triple Salchow-triple toe, a triple Lutz and double Axel to score 67.34 points. He finished 10th. “I had meniscus surgery at the beginning of October so I had to use every minute and every second of training,” the seven-time national champion explained. Now he is looking forward to the free skating on Saturday.